Fishing sling packs are one of the most versatile fishing packs on the market today. Their accessibility and streamlined designs have made them very popular with anglers of all types. 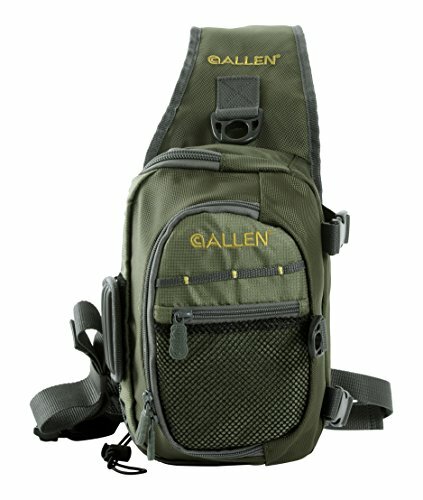 You can think of the best fishing sling pack like a hybrid design between a fishing vest, chest pack, and a backpack. They come in a variety of sizes to provide for minimalist anglers, and the gear-heads alike. Water and sensitive electronics don’t play nice together. With that in mind, you may want to consider a waterproof sling pack so you can wade deep, or in the rain, without concern. And if you need the full waterproof ensemble, you might consider pairing your waterproof sling with a waterproof wading jacket for those blowing rain storms. We appreciate that you’re angling for the best products and exceptional value for the money. After extensive (and admittedly quite enjoyable) research, we’ve shortlisted five candidates for the accolade of best sling pack for fly fishing. Let’s take a closer look at each of them below. 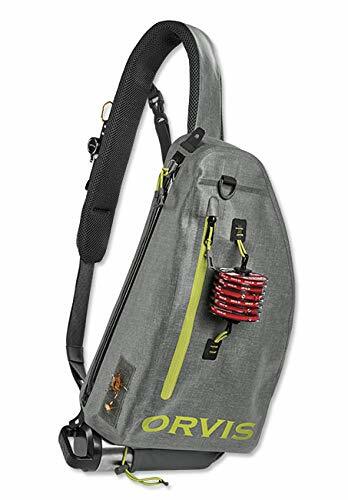 The Orvis brand is one of the most popular on the market, and their fly fishing slings have been used by many anglers over the years. Given the quality of their Safe Passage Guide Sling Pack, it’s not hard to see why it landed our first choice. It has everything most fishing enthusiasts could ever need. It easily slides from front to back through the use of a single strap, which also allows for air to pass through to prevent you from getting hot and sticky in summer heat. Aside from being comfortable, it has a number of key selling points. 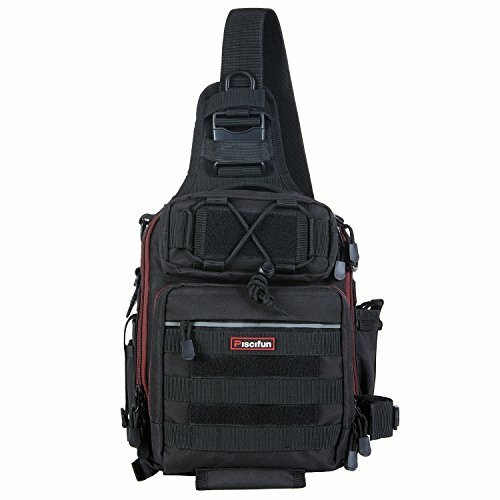 While all anglers have their unique needs and preferences, most agree that storage is a key feature of any sling pack. 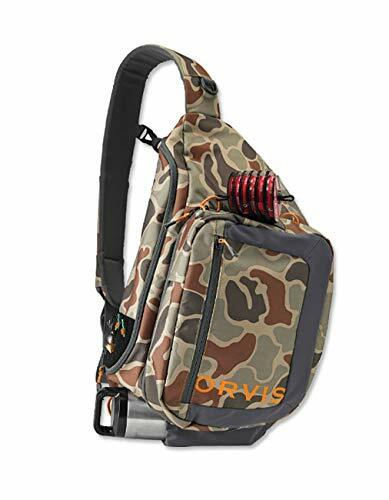 This Orvis sling pack boasts ample storage space (1,391 cubic inches), meaning you can keep everything from fly boxes to your lunch within easy reach at all times. In truth, you could even fit a rain jacket in the sling pack. The hemostat carrier is an ideal size while the external nipper tool will save time for novices and regulars on the rivers. The water bottle holder is positioned in a handy place and can hold a 1l bottle. Even when heading out for a full day of fishing, this solution has a great capacity. While appearances aren’t often the top priority when searching for a fishing sling, it’s never a bad idea to find an item that looks the part. Aside from carrying the branding of trustworthy company, the camo appearance is one that will leave you looking great on the riverbanks. Moreover, the internal areas are brightly colored to provide a clear contrast on the items that you may have lost or misplaced. The days of spending ages looking for a specific fly, fishing item, or Power Bar can be a thing of the past. Our top waterproof solution went to the super popular FishPond Thunderhead Sling. With two basic color schemes on offer (shale and yucca), the first impressions are that it’s a versatile solution that focuses on simplicity. In truth, those feelings do not fade regardless of how many times you use it. There is no question that this design has big appeal with guides and anglers who log hundreds of days per year, as well as infrequent fishing enthusiasts that are likely to spend just a few days on the water. Chances are you fall into this category somewhere. And if you need a waterproof sling pack, this is the one to look at. For the harcore fly fisher, the three words above describe virtually everything you could ever want from a fly fishing sling pack. In that sense, the FishPond Thunderhead Sling ticks all of the boxes, starting with a light and compact design that offers enough internal space without being OTT. This is supported by the use of exterior Hypalon tabs and cord loops that allow you to easily attach items without fear of them falling away. The use of a fully waterproof material makes it a practical option in all weather conditions while the shoulder strap and zippers are up to the task too. The fly fishing sling is designed to offer easy access to fly boxes and other features that may be needed in the water. However, you don’t want the bag to get in the way, which is why the small and lightweight solution is a winner. Moving it from your back to the front or side is easy. Moreover, when fishing, you can hold it on your back without compromising your natural casting stroke or putting a strain on the shoulder. Meanwhile, the color is practical for anyone wanting a waterproof sling pack that can also prove useful during hunting season. FishPond were quite late to the fly fishing sling party, having spent many years producing other products for the modern angler. However, their Summit Sling is undoubtedly one of the best on the market. It’s comfy, durable, and packed with various attachment features. One of the coolest features of the FishPond Summit Sling is that it is created using an eco-friendly Cyclepond recycled fishing net nylon material. However, the stylish fly fishing sling has so much more to offer. The FishPond Summit Sling boasts the winning combination of being big enough to hold the necessary fly fishing gear and tackle (as well as things like sunglasses) while being light enough to swivel from your back to side with ease. The shoulder pad offers great comfort too. A patented signature molded drop down fly/cargo bench provides the perfect place for holding fly foam attachments while Hypalon and tool attachments can be found in various practical positions. With four compartments for storage included, fishing the lakes and rivers has never felt simpler. Despite boasting a right-hand design, it’s suitable size means it can still be used by lefties without too many issues. There’s nothing worse than buying a product that feels great on the first usage only to become faulty after two or three sessions. FishPond is one of the most reputable brands in the business, and their fishing sling pack boasts the quality you’d expect. Without being 100% waterproof, it does a good job of keeping your items dry and protected. The use of water resistant zips is of particular note while flexible TPE lash tabs for rod tubes add to the overall function. In addition to being durable, the greens and oranges used for the color scheme are also very pleasing to the eye. 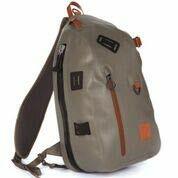 Like FishPond, Orvis takes up two places on our shortlist of five fly fishing sling packs. This waterproof solution is one of the most popular items on the market, especially for the more casual fly fishing enthusiast. It offers fantastic reliability time and time again. A lot of people may argue that it isn’t the most attractive fly fishing sling on the market, but that doesn’t prevent this from being a fantastic option that should be considered by first-time anglers and seasoned users alike. 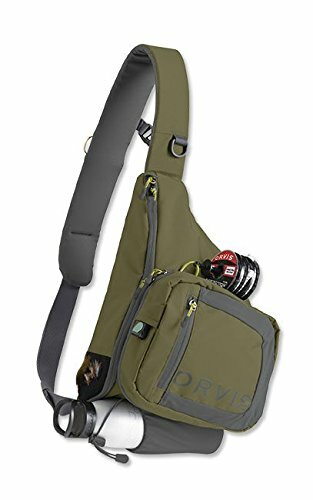 Any product carrying the Orvis name comes with an expectation of quality, and this bag has an added and adjustable shoulder strap, along with good internal storage. Supported by the fly-drying patch that’s also included, this truly is one of the most practical solutions on the market. The 854 cubic inches of internal storage means its capable of storing the items you’ll need for a day on the water. The D-loops and other external attachment fixing points overcome any issues the smaller size could bring, allowing you to focus on fly fishing. The waterproof features ensure that your goods stay protected and dry. Without being aimed specifically at guides and gear-heavy anglers, the Orvis waterproof is ideal for those demographics. The larger bag is supported by a nicely padded strap too, meaning it’s super comfortable for anglers of all sizes. The colors aren’t overly exciting but you certainly won’t lose the bag. Moreover, it can be easily positioned from back to side or front, allowing the quick changes to encourage the best fishing experience. And there’s still space for a water bottle and a wading jacket. 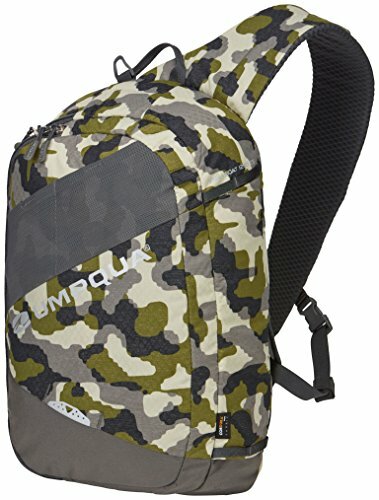 Available in three different colors, the Umpqua Steamboat fly fishing sling pack is designed to give the user maximum comfort and versatility. 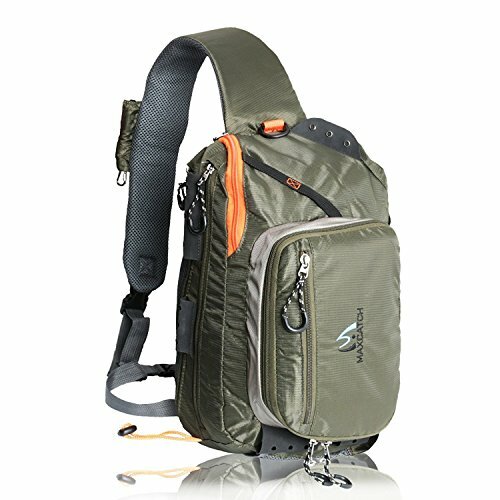 This is also evident in a number of the features shown on the sling pack that is particularly ideal for fly fishing on the streams. The fishing sling pack comes with a lot of enjoyable features that will make your fishing trips more satisfying whether it’s for a few hours or a full day. From novices to seasoned fly fishermen or women, this sling pack is a worthy candidate. 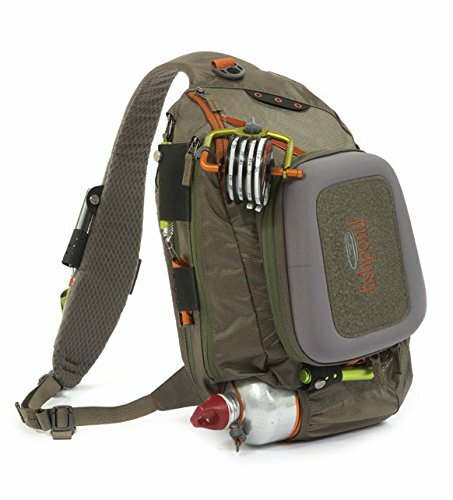 The Umpqua sling pack for fly fishing boasts 1200 cubic inches of internal storage, which is more than enough for the majority of fishing trip adventures. Perhaps more importantly, it is organized well with a main storage compartment for jackets, water bottles, and your lunch. This is complemented by a secondary storage compartment that holds four large fly boxes. A front pocket, four Zero Sweep retractor stations, two Zero Sweep tool sheaths and two Zero Sweep foam fly patch stations complete the fishing sling, encouraging a comfortable day on the water. It’s a great price too. When spending a day on the lake, stream, or river, you could be wearing your sling for many hours. This is one of the main reasons for choosing the fly fishing sling over backpacks and alternative solutions in the first place. So, you need to be certain that you’ll feel comfy for the duration. Made from a 420 denier nylon material and boasting a wide and fully padded shoulder strap with complete back-panel, the Umpqua Steamboat Sling Pack delivers big time on comfort. At just 1lb in weight, plus whatever you store, it is an ideal solution for long days. And with this sling pack being built to last, you can put in as many days as you’d like. Every fly fishing enthusiast can appreciate the need to equip themselves with the right fishing equipment. After all, we’ve all had the uncomfortable and unproductive experience of attempting to make a go of it with inferior gear. While there are many important items on your checklist, few match the significance of a great fly fishing sling pack. We listened to your feedback and updated the pack accordingly, adding two lash tabs on its side. Now, transporting your rod in a rod tube is easier than ever! WATER-RESISTANT & DURABLE: Water-resistant 1000D high density nylon fabrics, made with high-end equipment to ensure its safety. The abrasion resistant and indestructible KAM buckle and SBS zippers (Full-length double zippers), more durable than the competitors'. ADJUSTABLE & DETACHABLE STRAP: Two left/right exchangeable, adjustable and detachable shoulder straps. The main strap length can be extended up to 51.2'', while the associate strap can be extended to 36.2''. Can be used as Sling shoulder bag, backpack, handbag, chest bag, fishing tackle bag, travelling bag etc. Two rod belts to hold your rods. MULTIFUNCTIONAL TACKLE BAG: Dimension of main compartment: 11.8*8.3*3.9in. It is convenient for you to storage the lures, pliers, line, fishing lure boxes, wallet, phone, ipad, camera, books, keys and other accessories you need in your life.